I was delighted to be invited to take part in the blog tour for the latest collection of short stories by Orenda Books, The CWA Anthology of Short Stories: Mystery Tour. For those who don’t know the CWA stands for Crime Writers Association and membership includes some of my favourite authors whose short stories appear in this fantastic collection. The book is a complete mystery tour that takes you from Glasgow to South Africa to the Ukraine. Each of the stories as you suspect has a rather murderous intention behind them, or do they? One intriguing story with a rather clever twist was from Judith Cutler and I’m delighted to welcome her to acrimereadersblog to talk about short stories. Welcome Judith. I loved your story in A Mystery Tour. What was the inspiration behind it? I just hope life doesn’t decide to imitate art, in this case. My husband, Edward Marston, and I are privileged to be invited to take on a lot of speaking engagements. We almost always do these together – we call ourselves Murder Ancient and Modern. Some call us the Morecambe and Wise of writing… However many events we do, and however well we’re prepared, there’s always a frisson of anxiety: is this the right day? Will we have an audience? Once I was ready to speak – to find an audience of zero. Last time I was in the USA I shared a signing session with C J Box and Jeffrey Deaver – an exercise in humiliation since none of my books had reached the conference and their fans formed queues pretty well round the block… So far, however, I’ve not turned up to find the event cancelled at the last minute. It must be very nerve wracking doing events like that, fingers crossed your story stays as a fiction one rather than influencing real life! Do you prefer short story writing or full length novels? Predictably, since I had success with the short form at the start of my career but didn’t feel I’d “arrived” as a writer till I saw my first novel on bookshop shelves, I’m going to say I like writing both. A novel is a Test Match of an endeavour: you’re going to live with characters who grow and develop over many chapters – and sometimes several novels. There is time to slow down, time to accelerate. I might be tempted to continue the image: a short story is more like T20 cricket –swashbuckling and speedy, with a rapid outcome. But I’d say a short story requires, in proportion, more concentration and effort than a novel. Each and every word must carry its weight – not a punctuation mark must be wrong. A story demands to be put away for a while to mature, so you come back with fresh eyes and can prune even more. Can you tell us what a typical working day looks like for you? It used to be very much the standard 9.00 to 5.00 working day that thirty years of college work had got me used to. Sadly about three years ago I injured my right hand so badly (at a church fete – don’t ask!!!) that I’ve had to reduce my time at the computer. Now I limit myself to about a thousand words a day, and spend the non-writing time doing things to keep the rest of my body fit: Pilates, ballroom dance, gardening and tennis (I’ve taught myself to play left handed though thank goodness the right hand is beginning to work again). An injury at a church fete sounds like an ideal short story plot, although glad to hear you are on the mend. How would you spend a perfect afternoon away from work? Having played tennis in the morning, I’d go on to a cricket match. I love the game so much I dedicated my latest book, Head Count, to the cricket charity for young people called Chance to Shine (www.chancetoshine.org). I’d round it all off with a concert given by the wonderful City of Birmingham Symphony Orchestra (with luck conducted by their brilliant young musical director, Mirga Gražinytė-Tyla) in Symphony Hall. Are you an avid reader yourself? If so, which authors do you find yourself returning to time and again? Like many writers, I want to read a lot more than I do. One problem is that many writers are better than I am, so I end up feeling downhearted about my own work. One or two aren’t as good as me, so why read them? This applies at least as much to so-called literary novels as to so-called genre-writers. But for consistent pleasure, can you beat the dear late Reg Hill for his amazing use of language in entirely the appropriate setting? I also love Kate Ellis, Amy Myers, Martin Edwards, Priscilla Masters – and many others whom I’m honoured to call friends. Oh, and there’s Edward Marston, of course – and I get to read his before anyone else does! As for old favourites, Jane Austen and George Eliot take a lot of beating, and when I’m feeling down who better to cheer me up than Georgette Heyer? I think that applies to us readers too, there are always too many books and not enough time. That’s why short stories are so great as they can be dipped in and out of. Finally, can you tell us a little bit about what you’re working on next? That sounds really intriguing Judith, I’ll keep an eye out for it. Thanks very much for joining me. 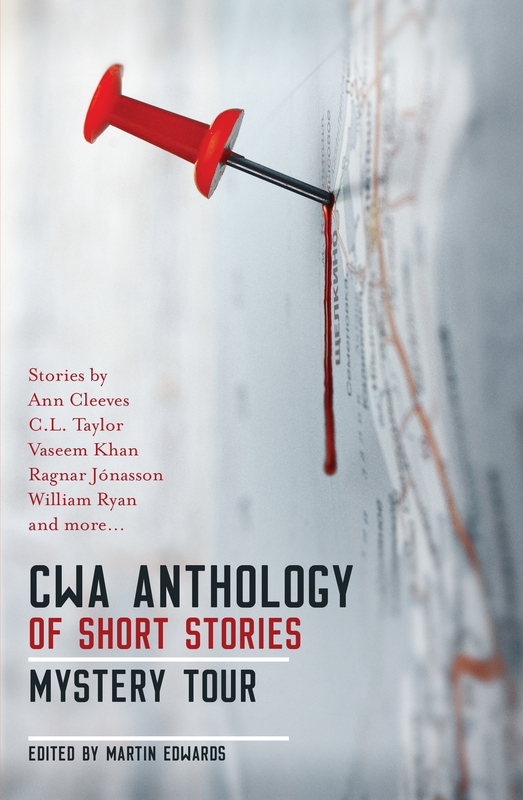 The CWA Anthology of Short Stories: Mystery Tour is out now and is well worth a read.